All you nuts could better embarrass yourselves if you include words like “Roswell” and “Haliburton” in your opinions. same jet, same altitude. different contrail. IIIcornIII, the type of contrail formed depends on the temperatur and the humidity of the air it is passing through. Look at these combined photos of the 808 contrail. See how later the jet is leaving a much shorter contrail, probably similar to the one in your video, but of course still viewed from an unusual angle. I saw that photo on your post already. But I don’t see how it supports your theory. You are saying it is moving between 2 regions of air but you are also saying it is a passenger jet that is flying at a level altitude. Not sure how it can be both. And It looks like 4 rockets to me. Wow, I can’t believe you people are still going on about a missile. Lots of talking since I went to bed but as I read the comments no one has posted any facts. Only conjecture, theory and guess. So here’s my 2 cents. Someone commented that “I want to know why no one is interviewing possible witnesses”. I can tell you why, because there was nothing to witness. But if you need a witness, I’ll step forward. I arrived at lax from oakland at just after 4 pm on monday. Was in my car by 4:30 and then drove south on 405 to long beach in rush hour traffic looking into the rough direction of this event. About an hour drive. I saw nothing unusual. 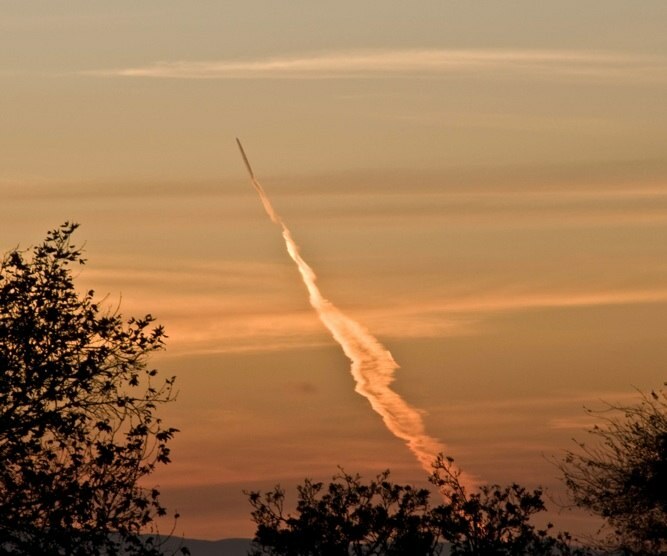 I saw no exhaust plume rise into the sky and leave the atmosphere (because I would have taken a picture of that kind of event in that location) which is backed up by the video which clearly shows the trail thinning and eventually stopping. All sunset launches from Vandenburgh always have a very spectacular “northern light” type effect to observers east of the launch as the exhaust left in the upper atmosphere reflects the light of the already setted sun. This did not occur in any form. There were no mysterious “flashes of light”. Also remember that the trail to observers on the ground would be maybe half the length (someone else can do the math above) of that viewed from the video because the helicopter was several thousand feet higher making it’s view much more eye catching. Also this is the land of the “15 minutes of fame” crowd. If something occurred, you don’t have to go look for them, they will come out of the woodwork. Especially since it was reported live on tv. If there was something to see every “attention seeking whore” would have run to photograph, videotape whatever to get their face in front of a camera. But there was nothing to photograph except for maybe a very small sector of people who were lined up directly with the trail like the helicopter. For the rest of us there was nothing to see but a very colorful but much shorter contrail then in the video coming inland and ending before reaching the coast line as the moist air over the ocean gives way to dryer air over the land. So, nothing to see here so move along. lllcornlll, out over the ocean that day the air was more humid and/or cold than over the land. It’s very common. So as the plane approached the land, it moved from one air mass to and adjacent air mass. It’s why you see contrails start and stop sometimes. Check out the satellite image for that day 11/08/2010, a few hours earlier. See how there are clouds in one area (out to sea), but not over LA? That’s because the atmosphere varies in temperature and humidity from place to place. Uncinus, couldn’t agree more. That morning a weather system had moved through So Cal which brought rain to different parts of the area. The air behind the system would have been full of moisture, especially out over the water which would cause contrails to be much bigger and longer lasting then typical contrails. Longer in length, fuller in size and longer in duration contrails indicate high moisture in the air while smaller, thinner shorter duration (or nonexistant) contrails indicate less moisture. The weather that day was conducive to big contrails over the water when compared to a typical day. How high was the helicopter? How many is several? How high do you think they hover? To me it sounds like you are saying this chopper was about as high as it could possibly go which would be a crazy way to catch the sunset. Doesn’t really matter because nothing else you said makes sense either. lllcornlll, I figure the helicopter was somewhere between 1000 ft and 5000 ft. Typical helicopter flight altitudes in LA. At the beginning of this site, Uncinus describes how to calculate how far someone can see because of the curvature of the earth. The higher someone is the farther the can see around this curve. So even if it was only 1000 ft high the helicopter would have seen and videod a much larger trail then observers on the ground. What part of my eye witness report doesn’t make sense? because I would be glad to go into more detail to make it clearer. I’d imagine the chopper was only around 1000 feet or less. They keep low to stay out of the way of local general aviation traffic. Sorry don’t buy it. The more photos and math and weather you bring into this, the more unscientific it gets. Sure makes it sound like you know what you are talking about tho. This is about the video. If this is a contrail of a passenger jet, why is it impossible to find a video of a known passenger jet that looks like this one did? So what if it was a rocket launched from a Sub? Southern California has plenty of military target ranges and since the rocket would be flying above controlled airspace for most of the flight it poses no particular danger. You don’t think that these kinds of dangers are flying all the time over your heads? People are generally very niave and have no clue of what really goes on out there as you only will ever know about these things when the Govm’t wants you to know or messes up, which is rare. I’ll bet few people know what the TFR around Mount Palomar in Socal is about and the high power laser activity in that area. I expect that submariners have to practice missile launches and since the target ranges are inland it is logical to assume that they must fly over Socal. No conspiracy, just military stuff going on, and you are not on the “need to know list”. You guys are absolutely hilarious. Really. I’ve never seen such naivety on public display since the Moon Hoax forums. Plagiarist boasts his credentials as a photographer and a technician. Wow. A tech, mind you, not an engineer. The difference is about 6 years of higher education and apparently a lot of IQ points. I thought it was funny, not classy. (Good job Mike). But I’ll indulge you anyway. Red on bottom, white on top, rainbow in-between. This plume is not vertical, because it does not have these traits. In your next post be sure to address this. Wrong. It stays in the same section of sky for the entire time he’s filming it. Since this is unsupported conjecture, it can be dismissed easily. Please explain how something moving at rocket speeds doesn’t go anywhere for 10 minutes. Wrong. Judging from this video, which has absolutely no engine flare, I conclude that the helicopter cameraman was lucky enough to be in the reflected path of the sunlight off the fuselage. Please explain how NO other videos or pictures of it show any light, ever. Your technical analysis shows how little you actually know about this. I would not hire you. Ok pencils down. The answer is “Unexpected turbulence for a straight and level flight is caused by entering A DIFFERENT REGION OF AIR!” (omg no way!). It’s ok. Everyone fails the quizzes. You can make it up on the final. This is about the video. If this is a contrail of a passenger jet, why is it impossible to find a video of a known passenger jet that looks like this one did? Erm, this IS a video of a known passenger jet. The contrail is in the EXACT SAME POSITION AT THE SAME TIME, as AWE808. Everybody, it is clear to me that lllcornlll is nothing more than a troll who is simply trying to keep this thread alive for his own amusement. NOBODY except a professional troll would, after being confronted with the mountains of scientific evidence presented on this site and elsewhere, continue to post ridiculous and inflammatory commentary the way he does. His posts are specifically intended to keep people’s blood pressure high, and that is the mark of a true pro. Ignore him. Do not feed the troll. He means you harm. He will scuttle back into his mom’s basement soon. lllcornlll, you say my statements don’t make sense and now you “don’t buy it” but you still haven’t given a specific example of what you don’t like. It’s not a conversation if all we do is say “yes it is”, “no it’s not”, “yes it is”, etc. JetPilot1, couldn’t agree more, but I had an hour to kill and I find it entertaining watching some of these peoples logic go round and round and in the end they don’t actual say anything. I told you what I don’t agree with. No offense to you or anyone else with an opinion, but do you really think you are more qualified than our entire government to figure this out? Yes there are some good points made here but they are made from one point of view and can easily be twisted around. The math is useless from a video unless you know the exact location of all variables. The photos are comparing apples to oranges. It just doesn’t add up. Who said that other video was of a known passenger jet? Oh ya, the person that runs this site. I and most of the world have only seen a few seconds of video and it is not enough to make all these assumptions. Maybe a rocket scientist could if he had other info to go with the video. I don’t care if it is a jet or a missile but i am interested and want to know for sure. Nov. 9 was my birthday and as I was sleeping in all I heard was missile this missile that but I thought I was dreaming. I have seen jets that I thought were launches at first, I know it can happen and this may be one of those cases. While this site and others have made some good points and all that, I still don’t see where it has been proven. But in the press it is now a fact. No official has said it is definitely flight 808. How is this site so qualified that it can say it is definitely flight 808? The FAA said it can’t even say that, which I also do not believe. I don’t claim to be an expert and I said all I need to. I will keep reading the comments tho. lol a professional troll. this is the first time i have ever posted on a site like this. do you mean i can get paid for this because that would be awesome. Yes there is scientific evidence here, but if you know anything about science you need to eliminate all variables to come up with a conclusion. I don’t see how that has been done. Smell you all later! Well good news! You have a trained rocket engineer in the room! These are from many years ago, but here’s a picture of my instructor explaining how rocket fuel burns in open atmosphere. And here’s a picture of it burning under partial containment. Here’s a picture of me loading the first rocket I ever made into a stand. *Sniff…memories…* And here’s a video of me firing the rocket, observing the mach diamonds created, and saying “That was awesome” at the end of it. I’m not claiming any authority. I’m just pointing out the track matches the photos exactly. 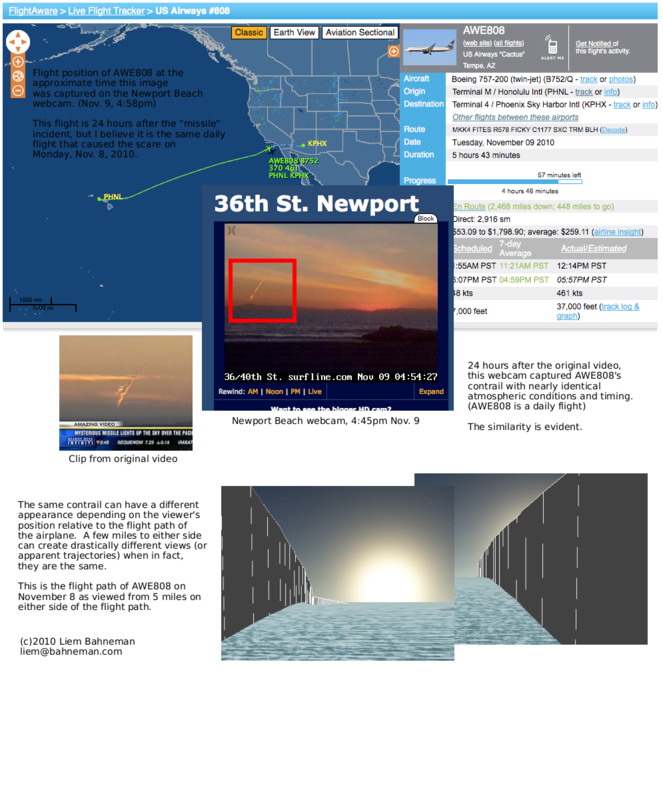 All the variables there are known – the time of day, the exact position of the aircraft, and the position of the photographer (condo on E Ocean Blvd, looking over Bixby Island). It matches, you can check it. OK, so it probably was just jet, but doesn’t anyone else find it a bit worrying that the US defense setup does not enable quick and accurate comparison of visual observations and radar/GPS or other instrument readings? Not having any expertise in such matters, it would seem to me that given the position of the aircraft and landmarks from a still picture or frame video footage it should be possible to draw a line along which the object must fall, even if distance is unknown. Then by overlaying a map with that line drawn on top of a map showing the positions of all known jetcraft in the air at the time of the video frame being analyzed. Assuming there is some degree of error in all these measurements and they best you can get is a cone instead of a vector and a certain radius of high confidence around the positions airplanes, perhaps there would be a few planes that could plausibly be responsible. If there were more than one candidate object, it should be use the pixel area of the object to narrow down the possibilities based on apparent size at different distances. Changes in pixel brightness and the angle could be used to further constrain choices. What if, instead of a funny looking jet plume, someone had witnessed, caught a glimpse of some sort of stealth spyplane from another country? Imagine this spyplane is detectable by our defenses, but only with a high rate of false positives. Such a craft would require a combination of visual and instrument observations to detect reliably. I certainly hope that our military has our skies covered with human eyes in addition to the finest electronics and best algorithms available. If our defenses lack the ability to make visual observation and instrument readings work together effectively, that seems an awful Achilles heel. WAS it United Parcel Service flight 902 or US Airways flight 808??? It can’t be both!!! wich one was it? Has United Parcel Service confirmed this? Uncinus, nice job on matching the photos to the flight path. Hopefully that will persuade some but I doubt it. i’m 90% sure you are all a joke. first you are positive it was 808, you say download the flight path it proves it. now you are positive it was something else. and you aren’t even coming up with this on your own. why should we listen to you, sounds like the other guy knows more than you, lol. and he is just blogger that doesn’t even proof read his posts. At least he is a little more honest about the other possibilities and variables on his site. have you ever considered that all you have is a hypothesis and you can not possibly have enough info to come to a conclusion? just cause a plane may have been in a general area maybe around the same time possibly does not confirm anything. it’s a theory. along with all the other info you have provided. just because you can find a pic that illustrates your point does not make it scientifically relevant. i hate to keep using that wording because i am not a scientist either, but that is how you are representing it. none of it necessarily fits this case. all these people saying the people who don’t think it’s a jet are conspiracy theorists are hypocrites because that is exactly what they are. just on the other side of it. and because of your misreporting a theory to be a conclusion, the rest of us may never know the truth, good job buddy. lol lol lol, launching a model rocket does not make you a rocket scientist. where do you work mr. rocket scientist. if you were a scientist you would know this is all bull. and by the way i have a hypothesis of my own, it is there are a few “people” on here in collusion and also people posting under multiple names. pretty obvious. the picture that shows the track is a trip. it doesn’t match at all. i’m not wasting anymore time with you guys, good luck getting back in the news, i know you miss your 15 minutes of fame. lol lol lol lol lol, i don’t need to keep talking because you do a better job proving my point than i can. you know nothing. admit it. Uncinus, I just wanted to thank you for a well made site in which you presented information in a reasonable and understandable manner. Your site created a great environment for people with opposing views to discuss their differences and for all to see the event from all sides in order to form whatever opinion the information presented to each. Based on the discussions, your presentations and my own eye witness information, of which I posted, I am very comfortable going to bed tonight knowing in my mind what occurred Monday was just a jet. I know there are others who, based on the same data, have come to the exact opposite conclusion and what I say to that is I’m glad I live in the USA where we can agree to disagree. What I do know for certain is that I don’t have anymore info that I can add to the discussion that is constructive to the topic, so time for me to call it quits. Thanks all for a good discussion and debate and again thanks Uncinus for the place to do it. There were two flights that both crossed over Catalina Island at about the same time. The problem was lining them up with the video and the photos. It was difficult because the exact viewpoint was not known, and nor was the time, AWE808 seemed a better match to the initial data. It DID match. But once a new photo was found (from LAX, a distant viewpoint, with the EXACT time), then things could essentially be triangulated, and the correct track was apparent. But it could easily have been either plane. UPS was 2,000 feet higher, so it was the one that ended up making the contrail. See both trails cut across the sky in a similar way, but not knowing the precise time or viewpoint mean that intially 808 looked like the better bet as it was heading more towards Long Beach. Then, new information caused us to revise the theory. The mark of good science is being able to quickly modify your thinking if something shows you are wrong. I was wrong (not by much, but still), so I’ve revised. I see. What *would* make me rocket scientist, lllcornlll?